Porsche's first foray into production V10 power lies just behind the driver in the Carrera GT super car. Let's take a look inside Bruce and see what makes his 605 HP, 5.7-liter DOHC V10 tick. 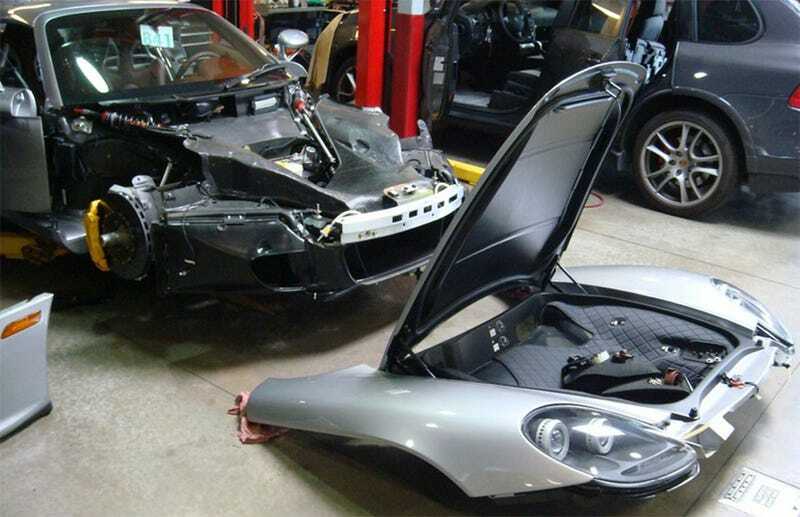 Teamspeed member, Peloton, took his $440,000 2005 Porsche Carrera GT in for its four year check up and was nice enough to share in the carnage. Just take a peak at the engineering techno-marvel, carbon fiber monocoque chassis and sub-frame as well as the super trick inboard coilover suspension set up and you'll immediately know why the CGT was (and is) so special. The carbon fiber monocoque tub and related sub-frame were developments from the 911 GT1 motorsports program and helped pave the way for future exotics like the Enzo Ferrari. Besides the obvious racing-inspired technology, the chassis also benefited from the use of carbon fiber by being stronger, lighter and more safe; ultimately providing the driver with more direct chassis feedback and a more exciting driving experience. Porsche engineers used a development of the 911 GT1 suspension system in creating the Carrera GT, giving split second response and confidence-inspiring behavior. The CGT utilizes pushrod suspension with double track control arms with coilovers operated by stainless steel pushrods and pivot levers, separating the suspension guidance from the spring action. This system is attached directly to the carbon fiber monocoque chassis for intensely detailed driver feedback. Negative acceleration is provided by the Porsche Ceramic Composite Brake (PCCB) system with cross-drilled 14.96 inch discs at all four corners. The engine is another technical marvel that's worth mentioning. Originally developed as a 5.5 liter by Porsche's racing division for a still-born Le Mans Prototype (LMP) program in 1999, it was shelved for a number of years to free up engineering resources to develop the Cayenne SUV. Once Porsche realized it had a stupendous engine just sitting around and with their new LMP program utilizing a 3.4 liter naturally aspirated V8, they decided to go full bore to create the Carrera GT. The original 5.5 liter V10 was put to use in the Carrera GT concept shown at the 2000 Geneva Motor Show, but the production version received a 68-degree V10 enlarged to 5.7 liters. An interesting bit about the engine is that it's a functional load-bearing piece of the overall chassis structure and the block has been built so strong, that there is zero distortion to the cylinder bores. In order to keep the engine low in the chassis, Porsche engineers looked to keep the engine as short as possible and did so by eliminating cylinder liners, instead coating the cylinders with a nickel and silicon solution that improves the overall durability of the 8,000 rev per minute engine. Another thing Porsche's engineers applied; a dry-sump lubrication system, that helps improve overall engine height, weight and reliability. As with other modern Porsches, the Carrera GT is water cooled and features a motorsport-inspired closed-deck architecture allowing for the cylinders to be cooled by internal water chambers. These goodies, all combined, help the Carrera GT produce 605 horsepower at 8,000 rpm and peak torque or 435 lb-ft. Helping transmit the German-bred horsepower to the ground is the first usage of the Porsche Ceramic Composite Clutch (PCCC), which we can see in a couple of the above images. The PCCC is a very compact unit, helping to keep the center of gravity low and also providing a positive effect on the engine's overall dynamics. Typically, the ceramic composite clutches used in motorsports have a relatively short life span, but the PCCC features a twin-plate dry clutch, carbon fiber and silicon carbide design, providing strength, lightness and an extended service life. Sitting above all of the technical giz-bang wizardry is a ball-shaped birch/ash wood shift knob set there to remind Carrera GT drivers of the balsa wood shift knob that sat in the 1970 Le Mans-winning Porsche 917. Oh yeah, that's Bruce alright. The biggest, baddest, meanest Porsche ever made turns 40 today. Happy birthday, Porsche 917.